There is a bakery in my SimCity city. It's got a big cupcake on the roof. It's been there, on the corner of some street and such-and-such avenue, for a long time (a few weeks!). Compared to Dunkin Donuts it actually is pathetic. I bet no one in my city likes going there. Dunkin Donuts, you see, pays out 2200 silver SimCity coins per day. I need this money to improve my city. The cupcake place only pays 156 per five minutes. Since these places only pay out when you click on them in Sim City Social, the patience-testing mutation of the classic SimCity that's ostensibly free on Facebook, the Dunkin Donuts is the better operation. Who has time to click on some mom and pop bakery every five minutes, you know? The other day, my Dunkin Donuts was on fire. I cheered for my fire trucks to save it. They did and spared me the single mouse click of energy I'd need to have spent to save it. Had it burned down, I'd have spent one bolt of in-game energy to bring it back. Easily. I'd save any building, but I can't say I'd have cared as much if the cupcake place was on fire. I guess this is how an outfit like Dunkin Donuts builds brand loyalty these days. They hook up with a company like EA and do a deal to get their brand into a game, adding a silly little Dunkin Donuts quest, even, just to give players something extra to do and to give Dunkin Donuts a little more attention from your consciousness. I'd say that that's great if it was making the games I'm playing cheaper. That's the promise of in-game ads, right? The ads go into the games and help keep down development costs. But SimCity Social is free, so what cost it's off-setting I'm not sure. Maybe it's off-setting the cost of people like me who resist the game's many urgings for me to pay to get ahead. What's smart about the Dunkin ad is that it implies that Dunkin Donuts is quantifiably better than any old bakery or coffee shop. Its superiority is coded into this game. 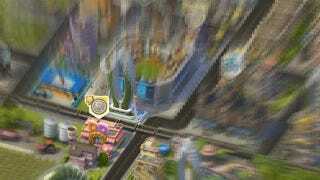 The SimCity Social player would be a fool not to build a Dunkin Donuts in their city. It makes the game easier. A colleague heard me talking about this and mentioned the licensed batteries in Alan Wake. The fact that I just had to Google to find out if they were Energizer or Duracell doesn't speak well to that bit of in-game advertising, but I now believe that the battery people would have been better served if they'd included some garbage Brand X batteries to make the licensed ones seem more terrific. A couple of years ago, I went to an advertising up-front for video games. In a rented out concert venue, representatives from various big gaming publishers took turns getting on stage and trying to convince ad buyers in the audience to place ads in or around their games. A person from Ubisoft mentioned the then-in-development I Am Alive. The game was about survival after a disaster, he said. Maybe it's not the kind of game a conservative advertiser would want to put their ads in, before pointing out to them that players in I Am Alive would desperately depend on items they found in the game world. Imagine if it was your brand of bottled water that players used to stay alive, he said. Imagine how good they'd feel about your brand.